Jhansi is a small village in Madhya Pradesh and deserves importance mainly because of its golden marks in the pages of history. The bravery of the intrepid leader Rani Lakshmi Bai makes this place popular, and therefore, it is currently visited by large numbers of people. There are also many other important places to find here, and therefore, it contributes a lot to the experience of the tourists. This fort was constructed by Raja Bir Singh in 1613 and has plenty of historical importance. 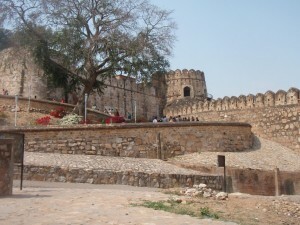 This fort is situated at the top of a rocky hill, and the entire village of Jhansi is built around this fort. Therefore, tourists come to see this fort. This used to be the hiding place for the combatants. This museum is situated in the fort of Jhansi and is also considered to be a must visit place for the tourists. The rich history of the city as well as the entire Bundelkhand region is wonderfully displayed in this museum, which should not be missed at any cost. This is a dam that is built about 25 km away from Jhansi and is situated in the Betwa River. The reservoir of the dam is built in such a way, so that it is perfect for large numbers of water sports. It is located very close to the Jhansi Kanpur Highway. This is located at a distance of 24 km from the main Jhansi, and this is a municipal district mainly renowned for the Barua Sagar Lake. The waters are clean here and people love to visit this lake. This town is located on the banks of River Betwa, and this town is mainly popular for Maithili Sharan Gupt, the national poet. other places are Rani Mahal, Maharaja Gangadhar Rao ki Chathri, Maha Lakshmi Temple, Ganesh Mandir.